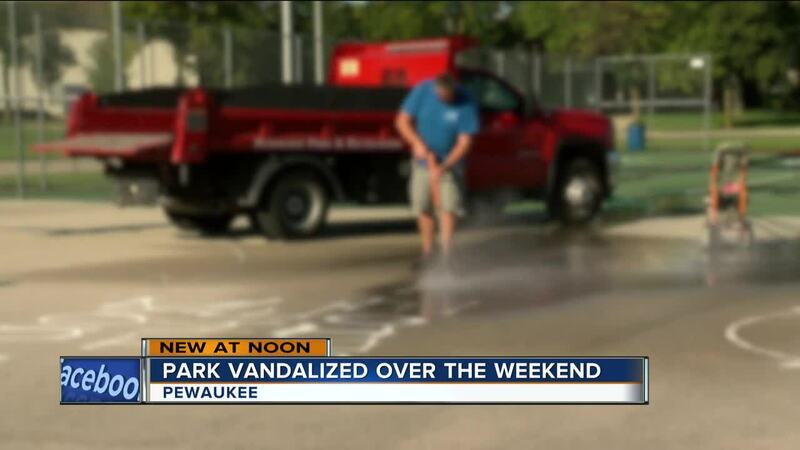 After a large amount of racially insensitive and vulgar graffiti was found in a Pewaukee park, the community banded together to make sure their message is heard loud and clear. 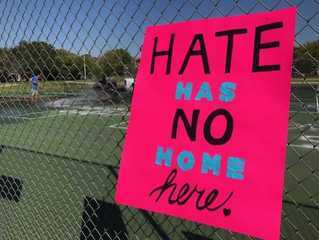 PEWAUKEE -- After a large amount of racially insensitive and vulgar graffiti was found in a Pewaukee park, the community banded together to make sure their message is heard loud and clear. "This is not at all representative of our community," Julia Westphal said. "The people we know in Pewaukee are a welcoming and wonderful collection of people. We're very diverse." When Westphal heard of the graffiti, she sprung into action. She and more than a dozen other residents came together to clean up the spray paint. "Disgusted," Westphal said. "This is not at all anything that any community should have to deal with. I'm shocked it happened in my backyard." It was no small task. White spray paint was all over the tennis court, basketball court, new playground, trashcans, benches and more. You name it, and it was covered in white spray paint. But it didn't end with just a little elbow grease from residents. "After we cleaned here for about five hours yesterday, we wrote letters of thanks and gratitude to DPW, the Parks & Recreation Department and the Police Department for their work," Westphal said. "We needed to get that message out that we are a welcoming community." Signs hung on the chain link fence surrounding the graffiti filled tennis court. The signs promoted acceptance of equality and a strong message that this vandalism did not speak for the people of Pewaukee. "This is what we represent in Pewaukee," Westphal said. "We take pride in our diversity. This is not at all representative of what the message is of what we want to put out for people that don't know about Pewaukee." The signs were more of a surprise than the vandalism itself. "They washed all the playground equipment," Kelly Woldanski, Director of Parks, Recreation and Community Services said. "It's like brand new. We're so touched by that." The time and effort it takes to remove the graffiti was weighing heavy on Woldanski. 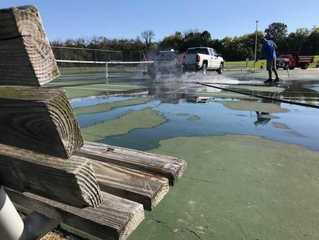 Plus, she says it could cost thousands of dollars to re-seal the tennis court now that they've power washed off a large majority of the sealant. Factor in the broken benches and brand new playground equipment being damaged, she was concerned over how the park was going to be restored. But now, with the unprovoked help from the community, they're in a better place to get it done. "We are very loved and we have some awesome community support," Woldanski said. "It's amazing. It warms your heart and it brings tears to your eyes. We couldn't be more grateful honestly." Woldanski doesn't just work for the Parks & Recreation department. She grew up in Pewaukee and is proud of the city. She knows that is the sentiment among all Pewaukee residents. So she was confused by the racially charged graffiti in an area she knows and loves. "It doesn't add up in my head of what I think we are and clearly the rest of the community doesn't feel that way either," Woldanski said. "It's a very strong message of, we're a community of love and we take everybody in. That's what we are." "I've never been more proud of my community or my friends and neighbors than I was yesterday," Westphal said. "I woke up very disappointed when it happened but by the end of the day, I had a hard time falling asleep because it was so beautiful to see what happened. Love will always trump ugliness. It will always overrule."